The calculus contains the first appearance of quantified variables, and is essentially classical bivalent second-order logic with identity. It is bivalent in that sentences or formulas denote either True or False; second order because it includes relation variables in addition to object variables, and it allows quantification over both. The modifier "with identity" specifies that the language includes the identity function, =. 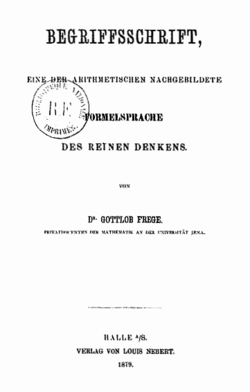 Frege's 1892 essay, "Sense and Reference," recants some of the conclusions of the Begriffsschrifft about identity (denoted in mathematics by the "=" sign). In particular, he rejects the "Begriffsschrift" view that the identity predicate expresses a relationship between names, in favor of the conclusion that it expresses a relationship between the objects that are denoted by those names. Zalta, Edward N. "Frege's Logic, Theorem, and Foundations for Arithmetic". Stanford Encyclopedia of Philosophy.